Buying Thoroughbred horses sight unseen from a Web site is scary. . .
We search out and find the best Thoroughbred horses for sale at race tracks all over. You will know more about the Thoroughbred horse for sale from the track than you will when buying a horse from someone you don’t know personally. A race horse’s history is public record and cannot be distorted. You will know the registered name of the horse you are purchasing so that you can check out his pedigree and race records. You can even watch videos of him racing. Most horses sold by Bits & Bytes Farm come with the horses’ registration papers. There are some exceptions especially if the horse is well bred and young enough to keep racing. By holding the papers back, the owner is assured that the horse will not be raced. www.pedigreequery.com – Free five generation pedigree report. See photos of horses in his family and even trace him back to the original three Arabians that all Thoroughbreds are descended from. Follow the male line back to the 1700’s to see who the horse is descended from. www.equineline.com – Free five generation pedigree with birth date and number of races run. This site is the Official Jockey Club Web site for Thoroughbred statistics and pedigree. For ten dollars or less you can order the detailed race records of the horse you are thinking of purchasing. You can also see videos of his races for just thirty five cents! www.calracing.com – Register for free and you can go watch the Race Replays from many of the horses we sell. Not all races or all horses are listed on this California Racing Web site but many are. The races are FREE to watch. We match the horses’ facts with your needs. 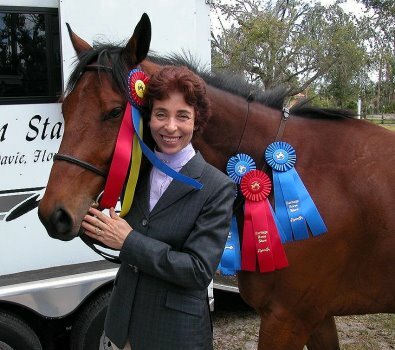 If you are honest about your needs, we can find a Thoroughbred that will please you. Be sure to have a veterinarian look over any horse you are thinking of buying. The next step it to check out is the horse’s soundness. There are many licensed vets at the race tracks who will examine the horse to your specifications. Be sure to vet check any horse you purchase. Race track vets are licensed professionals. They care about what happens to these horses at the track and after racing. They do not want to pass a horse as sound if he is not sound enough to hold up to a new career. Many horses have injuries and that is why they are not doing well racing. Understanding the true nature of the injury can give you an idea of the chances of this horse being sound in the future. Our vets are very cautious and cannot promise what the future holds for any horse. They will look at the horse at the track and take x-rays and tell you what they find. The cannot guarantee what the future holds but if they do not think the horse is suited to your needs, they will not tell you he is. If the horse is not sound for what you want to do, you can move on to one that is and there is no emotional attachment that might make you purchase even if the horse is not sound. Many of our horses have passed vet checks to be serious competition horses so you CAN find sound horses at the race track. Many horses will be sound with a little time off and some have injuries that will limit their next career. The difference between Bits & Bytes Farm and other sellers is that we will tell you the horses’ past history and whether it precludes a jumping career. We relationships with owners, trainer, breeders and veterinarians who support our mission of finding homes for ex-race horses. If a seller misrepresents a horse, we do not ever sell another horse for that person. The sellers who care about their horses will be honest about its past because they want it to have a good life after racing. What are Advantanges of Buying a Horse from Bits & Bytes Farm? Austin's Wolf is a horse we found a second home for when his first mom could not keep him. If you buy a horse from an individual who is selling their horse, you usually ask, “Why are you selling your horse?”. If they are selling the horse for a bad reason: horse bucks, horse refuses, horse is injured, crazy or whatever – the person selling the horse is not usually going to tell you the REAL reason the horse is for sale. If they did, you would not buy it. They just want to dump the horse on you and never hear from you again. There are exceptions and good horses are sold honestly by many people – but how do you know who to trust? So, buyer beware – whether you are buying a horse from a Web site, sight unseen, or one from an individual that you don’t know. Unlike individual sellers, we have a mission to promote the Thoroughbred breed. We are not trying to take your money and run. Actually it is just the opposite. We require you stay in touch, we are here to answer any questions you have even AFTER the sale and if for any reason you need to resell the horse, we want to help you do that – for FREE! We remove the emotion so buy you the horse that fits your needs. We are here to answer new owners’ questions and concerns before and AFTER the sale. Read our Success Stories and you can see what has happened to horses we sold seven or more years ago! That is the proof of our true success. Our mission is finding good homes for ex-race horses. We will do what ever we can to make sure you find the horse of your dreams and know how to train and care for him. Try it! You might just find yourself in our “Frequent Buyers’ Club”. Dr. Laura Durham-Dixon and Cortableau her seventh horse purchase!